Snow White looks pretty sprightly for a septuagenarian: On Sunday, the girl who kicked off the whole Disney Princess craze turned 77. The movie premiered at the Carthay Circle Theater in L.A. on December 21, 1937, a star-studded affair that brought out Hollywood’s brightest stars. Though she’s been around for nearly eight decades, Snow White still has her secrets. Here are a few of them. 2. In fact, even Walt’s wife, Lillian, thought the movie would completely bomb. 3. At one point during production, Walt decided that for everyone to understand his precise vision for the film, he would have to physically show them. He gathered the artists on an empty soundstage and spent hours acting out the entire script. 4. To give Snow White her famously rosy cheeks, the women in the Ink and Paint department applied real blush to the cels. One woman was especially talented at Snow White’s makeup application and was recruited to do it specifically for all of the close-ups. 5. In order to ensure that all of Snow White’s animal friends were captured just right, Disney kept a variety of live animals at the studio for the animators to reference. 6. Dopey was originally slated to be a chatterbox, but producers couldn’t find a voice that was quite suitable for the bald dwarf. Rather than outfit him with vocals they thought were wrong, Dopey went silent instead. 7. The Evil Queen (Queen Grimhilde, according to some sources) and the old hag/witch was voiced by the same actress: Lucille LaVerne. She managed to get a completely different sound for the hag’s voice by removing her false teeth. 9. To achieve the Magic Mirror’s hollow-sounding voice, voice actor Moroni Olsen wore a frame covered with drum heads over his head. 11. Animators believed that Walt had wonderfully expressive eyebrows, which he apparently used to great effect in story meetings. Except for Happy, all of the dwarfs have eyebrows modeled after Walt’s. 12. The movie was actually such a success that Walt used the profits from it to purchase 51 acres of land in Burbank to build studios—facilities that are still used to this day. 13. Attendees of the Carthay Circle premiere included Cary Grant, Shirley Temple, Judy Garland, George Burns, Charlie Chaplin, Marlene Dietrich, and Ginger Rogers. If you like what you hear, you’re in luck: After being hidden away in the Disney archives for decades, “Music in Your Soup” is now featured on the Snow White and the Seven Dwarfs soundtrack. 17. 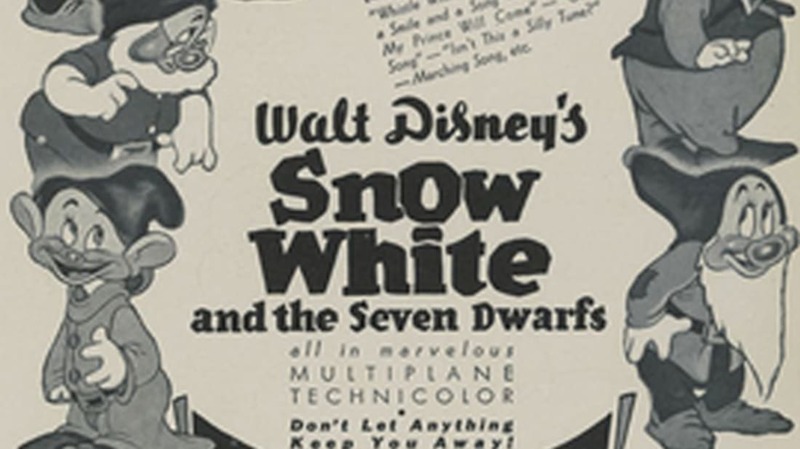 Speaking of which, in 1944, Snow White became the first film to ever release a soundtrack. 18. Rejected dwarf names names included Scrappy, Hoppy, Awful, Weepy, Gloomy, Snoopy, Silly, Gabby, Blabby, Flabby, Dizzy, and Biggy-Wiggy. 19. Snow White Returns? Yep, it almost happened. While not much was known about the overall plot, it was going to make use of some scrapped scenes from the original movie—including the “Music In Your Soup” scene. 20. Here’s proof that no one was immune to Snow White’s charms: Hitler considered himself a big fan. There has even been speculation that he did some sketches of the dwarfs—and indeed, Hitler was an aspiring artist before he became the most infamous dictator in history. 21. Prince Charming is only onscreen for a little more than two minutes total. He was originally supposed to have a larger role, but because artists found him difficult to realistically animate, Charming got cut. 22. Snow White continues to be one of the most innocent characters in animated history. Funnily enough, artist Grim Natwick was hired to animate her based on his previous experience animating one of the most provocative cartoon characters: Betty Boop. 23. Adriana Caselotti (above) was paid $970 for her work voicing Snow White. Walt Disney had her under a strict contract that forbade most acting work afterward, so Caselotti went into opera instead. She also continued to provide the voice of Snow White for various occasions for the rest of her life, even recording "I'm Wishing" for the wishing well at Disneyland at the age of 75.